Designed by Volvo Cars and made by Swedish brand Sandqvist, this laptop sleeve is made from vegetable-tanned leather and a twill made from organic cotton and recycled polyester. It fits most 13-inch laptops and has one external zipper pocket. Inside, there are four slip pockets and one pen slot. The lining is 100% organic cotton. 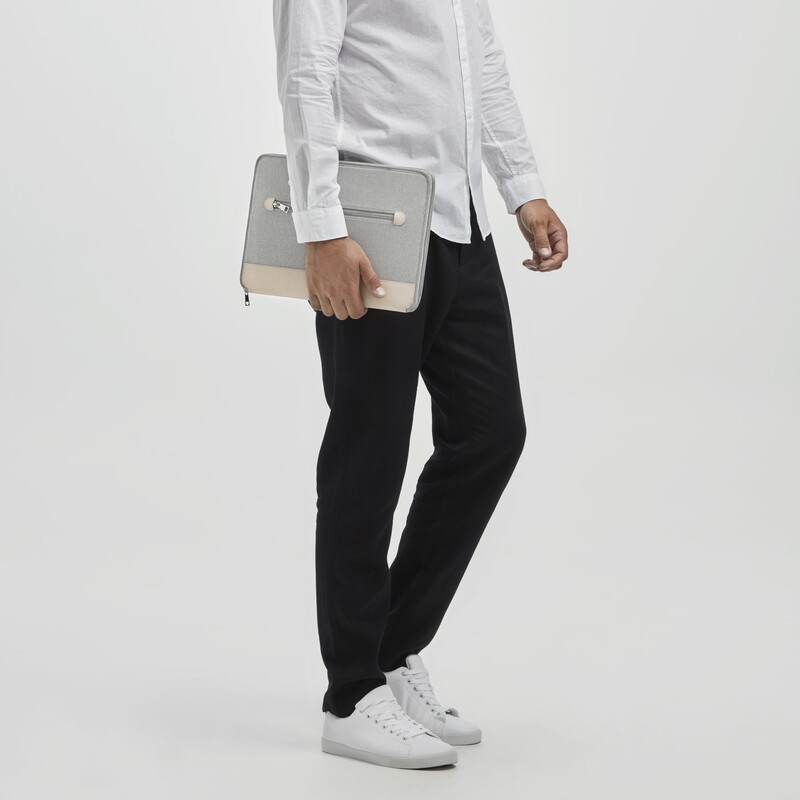 Finished in grey melange twill and natural leather, the laptop sleeve measures 35 x 25 x 1.5 cm. This leather is untreated and is going to darken beautifully with age. The natural leather has no protective surface, therefore you need to beware that it is also more sensitive to stains. The natural leather should be taken care of by applying leather grease or balm. We recommend using a natural product like Sandqvist Tangent Leather Balm. Applying leather balm will change the colour of the leather, but some of the colour change will fade out during the drying process. Repeat treatment whenever the leather looks dry. - Avoid getting the leather wet, if it would happen, dry it at room temperature. - If the leather has become dirty, try carefully brushing it off with a dry cloth or sponge as soon as possible.